While I was away from the internet for a hundred years and two weeks, one of the stories I briefly caught seemed to be the feel good Reddit story of the year. A redditor (who also like, won Jeopardy twice or something) got caught up in a thread in which a bit of speculative fiction- centering around a battle between the US Marines versus the Roman Empire- developed and attracted a bit of attention. So much attention, in fact, OP James Erwin achieved a major internet dream for some- Warner Bros. optioned his idea and it very well could get turned into a major motion picture. Alas, there are always bumps along the rode of internet-won stardom, and the Reddit movie could have run into some significant issues. 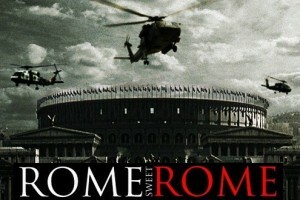 According to The Hollywood Reporter, the age old (to social networks, anyway) question of just who owns the rights to the tale has reared its head and could jeopardize the future of the film- which is, by the way, titled Rome Sweet Rome. Reddit’s copyright agent Jerry Birenz admitted to THR that the question is part of a larger “interesting issue,” and acknowledges that more than one party could claim a share of the Rome Sweet Rome pie. It will be interesting to see how the story plays out, but Erwin does have other, non-Reddit related projects to fall back on should the deal be compromised.